Recent events suggest a possibility that China will place a 25% tariff on soybean exports from the United States to China. Such a tariff would result in lower soybean prices and have numerous price and cost effects. We evaluate these impacts on the 2018-2021 financial performance of an average 1,700 acre grain farm located in central Illinois. Our analysis indicates a 25% tariff would result in a significant deterioration in cash flow. An attendant 20% farmland price decline would result in over a $500,000 decline in the farm’s net worth by 2021. Recently, the back and forth between the United States and China over tariffs has drawn intense interest. Each country has threatened to impose tariffs on important products from the other country. China threatened to impose tariffs on agricultural commodities such as soybeans, corn, beef, and dried distillers grain (DDGs). Because of the size of U.S. exports to China, the proposed Chinese 25% tariff on soybeans has received a great deal of attention. Whether or not these tariffs are imposed remains to be seen. Obviously, the imposition of a 25% soybean tariff will have large impacts on Midwest grain farms. This article evaluates the impacts of a 25% soybean tariff on an average central Illinois grain farm using the Gardner Farm Income and Policy Simulator (GFIPS). The model along with the central Illinois case farm examined here was more fully discussed in a March 6th farmdoc daily article. The case farm represents an average central Illinois grain farm enrolled in Illinois Farm Business Farm Management. Located in McLean County, Illinois, the farm has 1,700 acres, of which 11% is owned, 44% is share rented, and 45% is cash rented. At the end of 2017, the farm has $3,780,000 in net worth, a 26.8% debt-to-asset ratio, a 1.79 current ratio, and a debt coverage ratio of 150.6%. We simulate this farm’s performance from 2018 through 2021. Lower Prices plus Lower Costs. As a result of price decrease, non-land costs and cash rents likely will decrease. In addition, acreage in central Illinois, and more generally the Midwest, would switch from soybeans to corn. Farmland Price Declines. Lower commodity prices likely will lead to lower farmland returns and lower cash rents. As a result, farmland prices likely would decline. Each of the three above scenarios represents a variation from the baseline described in the following sections. Taheripour and Tyner recently examined several scenarios in which the Chinese government enforces import tariffs on United States soybeans ranging from 10% to 30%. They predict such tariffs could result in an annual loss in United States economic well-being ranging from $1.7 billion to $3.3 billion. At the farm level, that could mean a sharp short-term decrease in the price a farmer would receive and a 2% to 5% decline in prices over a few years. The tariffs could also lead to other economic implications at the farm level such as influence on the price of other commodities and land values. For the baseline without the impacts of tariffs, a corn price of 3.70 per bushel is used for each year from 2018 to 2021 (see Table 1). The soybean price is $9.70 per bushel for 2018 and then $9.50 per bushel for each year from 2019 through 2021. If China imposes a 25% tariff on their imports of U.S. soybeans, we estimate the 2018 soybean price will be sharply lower, moving down from $9.70 per bushel to $8.85 per bushel. This impact would then settle at $9.00 per bushel in 2019 through 2021. The increase in 2019 to 2021 prices is assumed due to a move away from soybeans to other crops. Some commentators expect more of a 2018 decline in soybean price than used here. While a larger price decline may occur, payments from crop insurance and the Agricultural Risk Coverage (ARC) program would begin at approximately $8.70 per bushel (see farmdoc daily, April 10, 2018). The imposition of a 25% tariff is assumed to have a small impact on 2018 corn prices. The 2018 baseline corn price is $3.70 per bushel moving down to $3.65 per bushel with the imposition of the 25% tariff. The lower price is assumed because of the positive correlation between corn and soybean prices. Corn prices would then be lowered to $3.50 per bushel in 2019 through 2021, largely due to an assumed increase in corn acres and a reduction in soybean acres. The lower commodity prices would result in lower net incomes. Over the 2018-2021 period of the simulation, the average net income under the baseline scenario is $50,677 per farm. The price response from the 25% imposition of tariffs results in over $44,000 less net farm income. The average net income over the four-years of simulation is $6,480 per farm (see Table 2). The economic response to a 25% tariff would extend beyond prices. Costs and cash rents likely would decline as well. Here we assume that non-land costs would decline by $10 from 2019 through 2021. This mirrors some of the cost reductions that occurred in 2013 through 2016, as the commodity prices declined from 2012 highs. We also assumed that there would be a $30 per acre decline in cash rent over the three-year period, meaning cash rents are estimated to be $257 in 2019, $247 in 2020, and $237 in 2021. This scenario assumes a large drop in cash rents. Cash rents are notoriously sticky in coming down. The low prices of this scenario are assumed to necessitate a cash rent response. A lower soybean price would make corn relatively more profitable than soybeans. Hence, we assume there would be a 5% acreage shift from corn to soybeans over the projection period. Changes in costs and the switch in acres reduce the impacts of the price declines on net income. After considering these cost reductions and price shifts, average net income over the four-year projection period would be $24,124 (see Table 2). While reductions in costs offset part of the income declines from the lower price scenario, the resulting income is still very low compared to the baseline. Even under the baseline, the average $50,677 net farm income does not result in a stable financial position. Net worth for the farm equaled $3.78 million at the end of 2017. Under the baseline without tariffs, net worth at the end of 2021 is reduced to $3.67 million (see Table 3). The current ratio is reduced from 1.79 at the end of 2017 to 1.67 at the end of 2021. Overall the working capital position is weakened. The operation no longer generates sufficient funds to cover its debt obligations, as indicated by the debt coverage ratio being 95.1%, lower than 100% when the operation is providing enough funds to cover debt obligations. As a result, debt relative to assets increases, as indicated by the increase in debt-to-asset ratio from 26.8% at the end of 2017 to 29.2% at the end of 2021. The imposition of a 25% tariff would increase the financial deterioration. Table 3 includes end-of-2021 balance sheet values for all three scenarios analyzed for tariffs (see appendix for values of the current ratio, debt-to-asset ratio, and debt coverage ratio over time). The “Lower Prices and Costs” column shows the combined impacts of lower prices and lower costs. Considering the price and cost impact, net worth declines to $3.59 million in 2021, an additional $80,000 loss over the baseline scenario. Working capital is further weakened leading to a current ratio of 1.45 and debt coverage ratio would be 85.3%. These levels indicate very serious cash flow issues. Debt-to-asset ratio is projected to be 30.9% at the end of 2021. This farm would face the need to reduce cash flows and likely also need to restructure debt. There still is equity on the farm to allow for financial responses, but equity is eroding. This farm owns 11% of its 1,700 acres and has $2.05 million of farmland real estate assets on the balance sheet at the end of 2017. Lower farmland returns likely would result in a decline in farmland prices. We assumed a 10% decline in farmland price in 2019, with an additional 5% decline in 2020 and 2021. The reduction in farmland prices would not have any cash flow impacts but would lower net worth and increase debt-to-asset ratio. Net worth is projected at $3.20 million at the end of 2021, a decrease of $580,000 from the 2017 levels. Debt-to-asset ratio would be projected at 34.2%. The farmland price decline worsens the financial position of the farm. The imposition of a 25% soybean tariff by China on U.S. soybean exports would result in a worsened financial and wealth position for the case farm examined in this article. Cash rent declines would need to occur to offset some of the price declines. Farms with different structures than the single case farm examined in this article could face different financial results. The 25% tariff would have larger negative impacts on farms with higher debt levels and higher amounts of cash rent. The reverse is true as well. Farms with lower debt levels and lower percentages of cash rents would fare better. In closing, it is important to underscore that these estimated impacts are not forecasts. 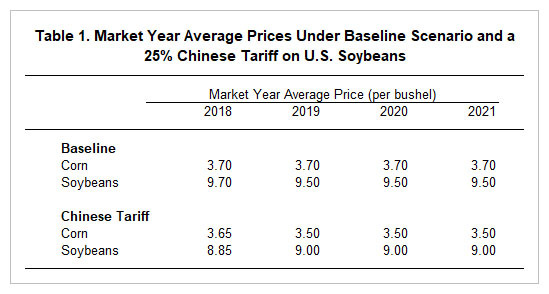 The financial and wealth situation of farms in 2021 will depend upon many events, one of which may be a 25% tariff on soybeans. The other events may offset or exacerbate the negative impacts of a tariff on U.S. soybeans by China estimated in this article. Schnitkey, G. "2018 Acreage Decisions: Steady as She Goes in Rough Waters." farmdoc daily (8):63, Department of Agricultural and Consumer Economics, University of Illinois at Urbana-Champaign, April 10, 2018. Schnitkey, G. "Revised 2018 Corn and Soybean Budgets." farmdoc daily (8):24, Department of Agricultural and Consumer Economics, University of Illinois at Urbana-Champaign, February 13, 2018. Swanson, K., G. Schnitkey, J. Coppess, and N. Paulson. "Introducing the Gardner Farm Income and Policy Simulator." farmdoc daily (8):39, Department of Agricultural and Consumer Economics, University of Illinois at Urbana-Champaign, March 6, 2018. Taheripour, F.H., W.E. Tyner. "Impacts of Possible Chinese Protection on US Soybeans." Department of Agricultural Economics, Purdue University. 2018. The initial case farm for the Central High region, introduced as Central High 1 (farmdoc daily, March 6, 2018) has been updated with information from the most recent budget projections (farmdoc daily, February 13, 2018), although prices vary from budget projections to achieve desired levels for this analysis and are used as noted in the article. GFIPS was also updated with the latest county level yield data from NASS and 2018 crop insurance premiums and spring prices prior to calculating the baseline used in this analysis. Yields used in baseline projections for 2018-21 are based on a historical yield trendline. Yields in recent years have been above trendline and comparably higher. Table 4 below show yearly results for the scenarios presented above.